Our new Seating Guide will help you find your perfect fit! The Pioneer 3 wheel scooter Model S131 offers superior maneuverability and performance with many extra features! The Pioneer 3 offers excellent indoor maneuverability, as well as heavy duty outdoor performance. 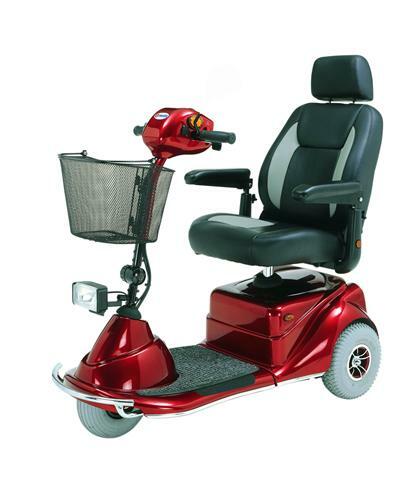 Standard features include swivel seat, head light, tail light , directional signals, front safety bumper and rear anti-tip wheels, ABS body and padded width and height adjustable flip-up arms. Large contoured captains chair with removable head rest is also standard. The comfort tiller adjusts to fit various arm lengths and folds down for easy storage. The 350 lb. weight capacity and standard foam filled 10" tires offers a break through in mid sized 3 wheel scooters at an economic price! 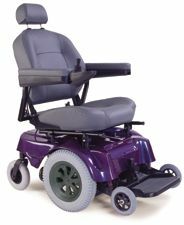 Swivel, sliding high back captains seat with height, width and angle adjustable armrests. Wheel Size 10" front and rear, foam filled. Front head light, tail light and directional signals for night driving. Standard 10" foam filled tires for easy maintenance. Front Basket standard, rear basket optional. Weight w/o batteries 127 lbs. 5 ah off board charger. External release lever for easy free-wheeling.